Can you confirm this was 1953 and the party was the Queens Coronation? It would also be interesting to get some names. There must be some forum members sitting round that table! It's just slightly before my time, but our prefab was just 100 yds down the hill from there. I can't help with what's what & who's who but just wanted to comment on what a great photo! Hope you get some answers. EMDEE wrote: It would also be interesting to get some names. There must be some forum members sitting round that table! It's just slightly before my time, but our prefab was just 100 yds down the hill from there. So where do you reckon it is Emdee? I thought Albyn Ave ? Feel sorry for the kiddie sitting on the prefab step,obviously he/she is not getting to go. The angle this is taken at shows the house above Dalintober school slightly hidden by the taller one that was demolished. The garden is in Davaar Avenue? The roofs of Milknowe Terrace are just visible above the woman (Annie Brodie from further along the Avenue?) wearing the black top and white collar. I wondered as well who the poor wee soul sitting in the background is? One for the Courier maybe and I am sure someone will have an idea of some of the faces. I think I see Dan Galbraith in there in the middle below the lady holding the baby? Definitely the top of Albyn Avenue... as far as I know the street plan basically stayed the same after the prefabs were demolished in 1964. Slightly off topic, but I wonder if anybody in the town was able to watch the Coronation on television? As you probably know, the Coronation was the moment when television ceased to be a novelty and when many people bought their first set. But C'town was not in an official reception area so it would be interesting to know if anyone in the town actually SAW the Coronation on telly. Certainly lots of people in the town had sets well before the old Redifusion relay system was set up. (Yes, I can remember that!) Indeed when I was a kid, there were still a few massive aerials around the town which people hadput up in the 50s to get some sort of reception from the central belt or Northern Ireland. 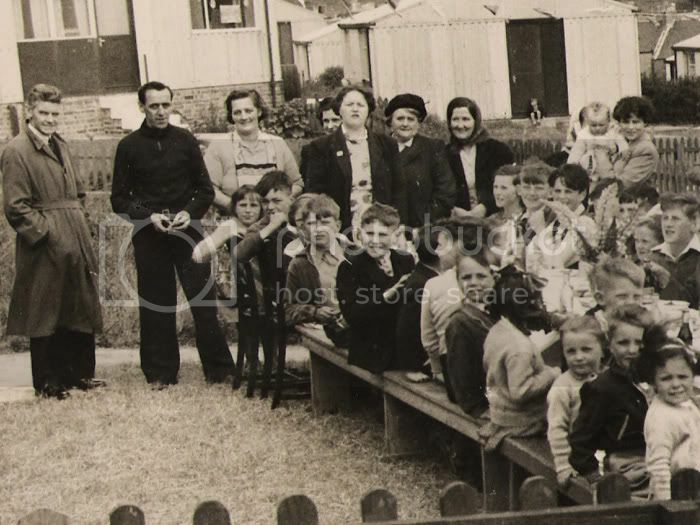 As like EMDEE i also can remember the prefabs and especially the one at Hillside road that had the roof blown of with if i'm right the occupant was in their bed? History wrote: The angle this is taken at shows the house above Dalintober school slightly hidden by the taller one that was demolished. The taller house had me puzzled in the photo and the other one would be once lived in by Mrs McGeachy the school teacher. History wrote: The roofs of Milknowe Terrace are just visible above the woman (Annie Brodie from further along the Avenue?) wearing the black top and white collar. And does look like wee Annie right enough who lived across the road from us in Davaar Ave (No78). I saw the coronation on television, but unfortunately not in Campbeltown. I saw it on my aunties 10" black and white TV, along with half the village of Elsecar in Yorkshire, because she was one of the very few people in the area with a TV, which made her house, actually, a prefab, very popular on Coronation Day! It was the day after my 10th birthday, and I can remember feeling a little aggrieved that it hadn`t taken place the day before. I don`t know, but I would think that Campbeltown was awash with red, white and blue bunting, strung between every building, our village was. 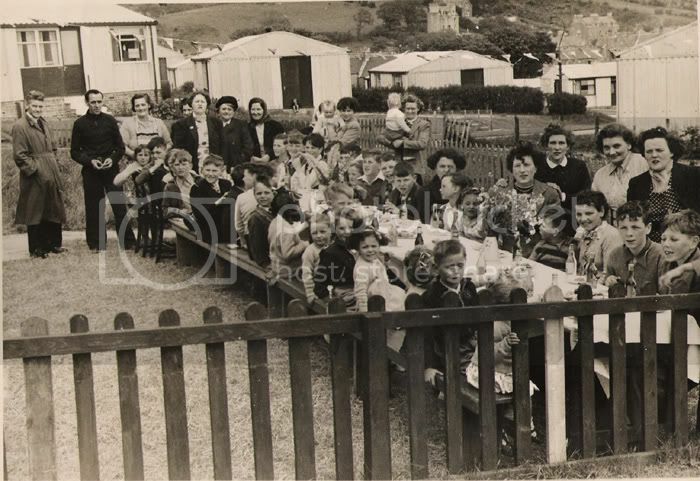 The table is in the garden of the first prefab on the left of the first cul-de-sac in Albyn Avenue, where the road is now that goes in towards Roading Cottages. The buildings over at Dalaruan are Cowdeknowes above, and further down the hill is Craigie Place. I thought that was a dog sitting on the doorstep on the other side of the road. EMDEE wrote: I thought that was a dog sitting on the doorstep on the other side of the road. Poor wee soul, all those kids having a party and he is sat on is own across the way. Perhaps it was a naughty step? Isn't that a kid with a gas mask on in the middle of the left row? Looks like it. Jamie it was called Craigie Place. I remember being told that there were 12 families in single ends in there? Not sure when it was demolished, maybe the sixties? Would be great to get all the photos in existence of all the Prefabs in Campbeltown on here. A few people have asked the Forum about this photo so here is the image split into two and enlarged so people can see better. 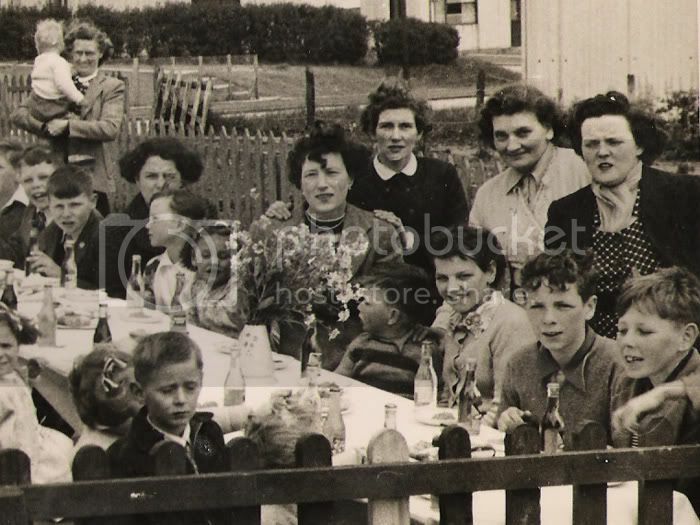 It was a surprise to come across this photograph of Albyne Avenue since my aunt, Jeannie Paterson, is the third person from the left standing at the back with the light coloured cardigan. She stayed in the top "lane" off the avenue. Her brother ran the small shop at the bottom of the avenue (Alex mason) and a sister (Jessie Galbraith) and brother (Willie Mason) stayed in Calton Avenue, round the corner. Jeannie was one of ten brothers and sisters and her mother, my grandmother, still stayed in Mill Street when this photograph was taken. MacTearlach - great post! Your Auntie Jessie and cousin Willie are also in the photo. It's a great photo right enough!